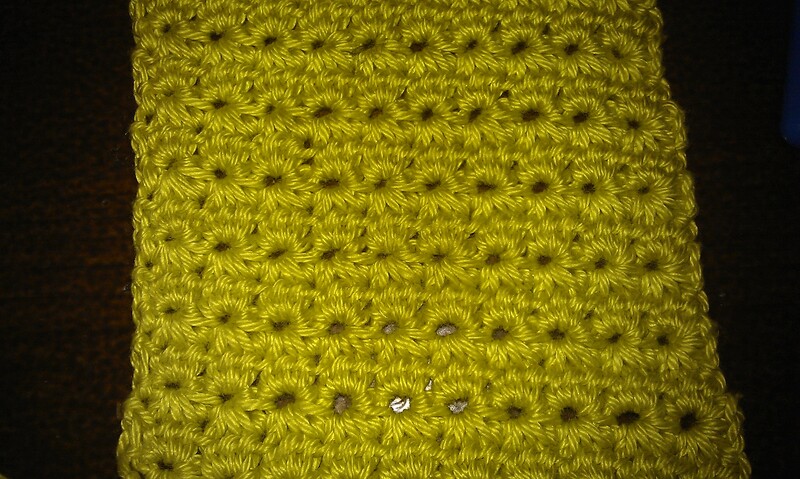 Step 1: Crochet two rows in star stitch (here is a good YouTube tutorial on this stitch) to find gauge, always comparing it with the device it should fit. For example: one full star in your gauge is 1cm wide. Your phone is 7cm wide then this obviously equals 7 stars. Now add two more stars to cover the sides as well. If one star in your gauge is less then 0.6cm then add four stars instead of two. 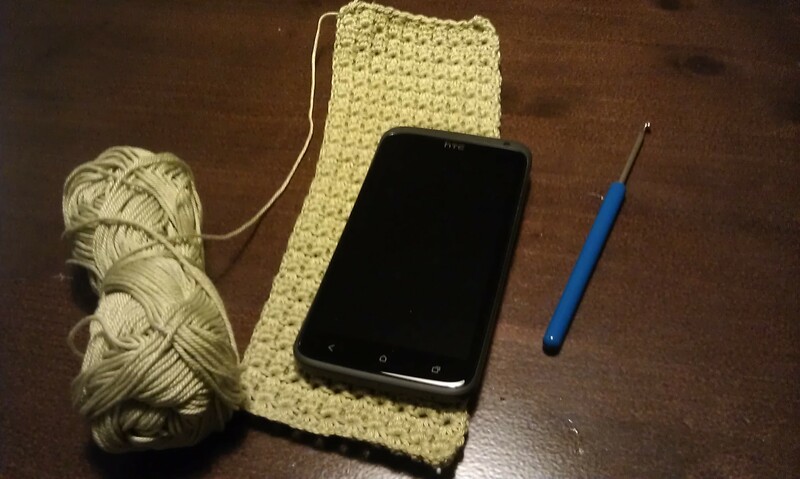 Step 2: Now crochet a piece that is twice the length of the device it should cover and add three more rows. If you want to create a lid, crochet as long as you want the lid to be. I opted for no lid just a strap to prevent the phone from falling out of the case. 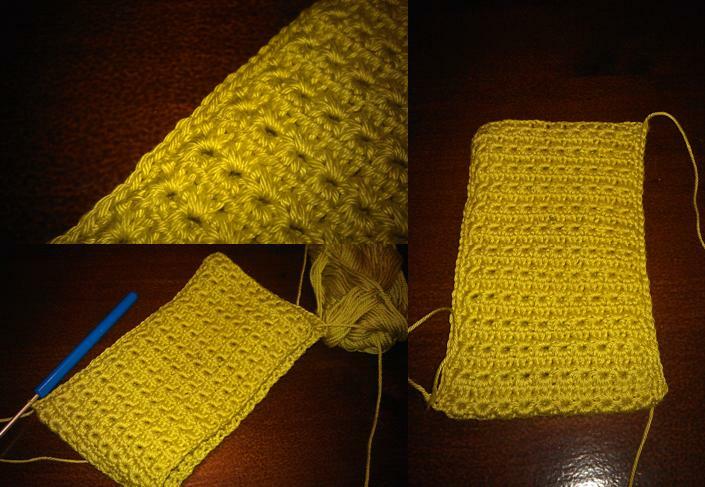 Step 3: Now fold the crocheted piece and crochet the side together with single crochet stitches. Each star equals three crochet stitches. You could sew the pieces together but I think a sc makes the seam look very neat. Step 4: Now measure the lining and cut it that you get the same size as the cover plus an allowance of 1cm left and right and 2cm on top and bottom. Sew the sides together right on right side. Step 5: Place the lining inside the cover the way you sewed it, inside out. The lining should look out 2cm of the cover. Now fold about 2,2cm of allowance so that it goes between the crochet outside and the fabric inside. When you look at the cover you should only see the crochet outside and no lining. Mark the folding line with needles. Take the lining out of the cover and pin the allowance, wrong side on wrong side along the line of needles marking the right size for the lining. Sew the allowance approx 1cm from the edge. This will keep the lining in better shape when using the cover. Step 6: Place the lining inside the cover again (still inside out) Now you can fix it there. I did this sewing by hand because like this you can fix it invisibly. You could also use the machine for that but then you would see a seam on the crochet outside which I think is not preferrable. Step 7: You are nearly there. Now you only need to make a strap and attach a button. 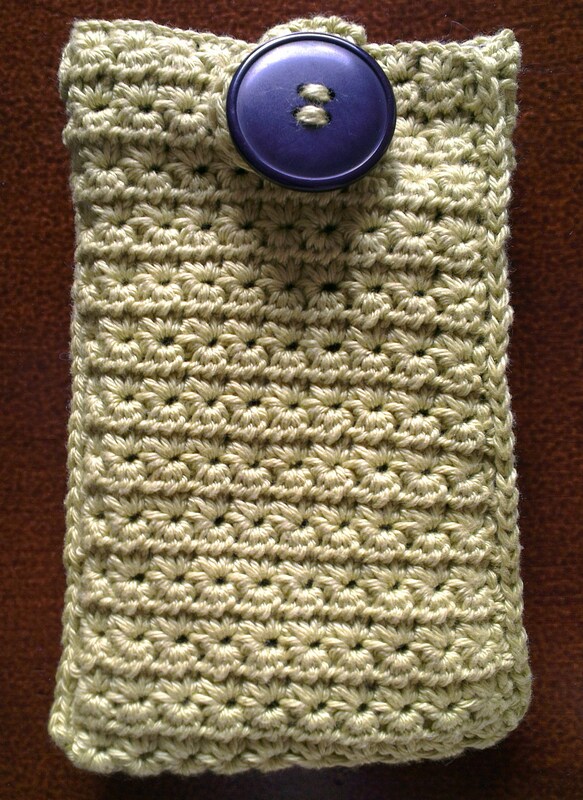 For the strap, crochet 5 sc on one side of the cover, turn. Follow it with 5 hdc. Now crochet a number of chain stitches, enough so that when attached to the strap it goes over the button easily. In my case with a very big button I needed 13 stitches. Attach them to the other side of the 5 stitch strap. Now sc in a circle first again over the 5 stitches of the strap, then over the chain. If you crocheted a lid, you only need to crochet a number of chain stitches, enough so that when attached to the strap it goes over the button easily and attach them in the middle of the lid. I would recommend crocheting a row of sc over the whole lower lid and the chain stitches in the middle for better stability. 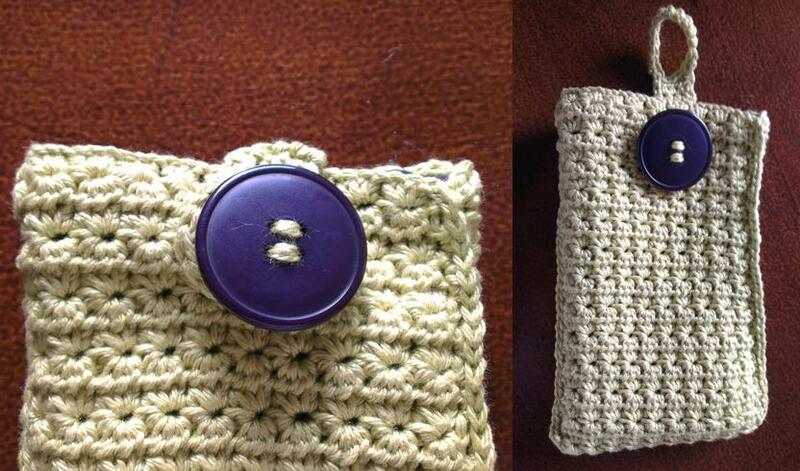 Sew in the loose end, attach the button on the other side of the cover and you are done! If you have any questions, let me know. And if you use this pattern it would be absolutely great to have links to pictures of your model here in the comments. 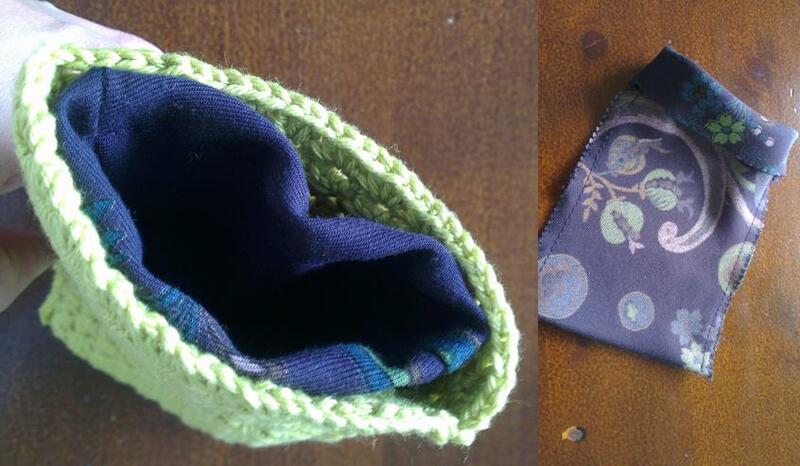 This entry was posted in Knitting & Crocheting and tagged Crochet, Tutorial by kathatravelling. Bookmark the permalink.